Update (01 July 2018): This was a long break of almost two months, but I will try make up for it by sharing a ton of new information that has come through during this time. This update will be in three parts, new issues in May and June, forthcoming stamp issues and lastly some trivia. Over the last two months, a total of seven stamps were issued, some personalities and some special commemorative stamps. In May, two personalities from Southern India - businessman M. V. Arunachalam and socio-political leader C. Kesavan were honored with India Post stamps. Stamp on Arunchalam was issued by the Governor of Tamil Nadu and the one on Kesavan by the Governor of Kerala. The stamp on Lions Clubs Centenary was dedicated at a simple ceremony by the Vice President of India in New Delhi. All these three stamps were decently designed, not much to talk about. Early in June, Prime Minister of India released a set of stamps in 4 designs on World Environment Day. The stamp designed by Suresh Kumar Achari depict the theme, Beat Plastic Pollution. I did not really like the stamps, but some collectors seem to appreciate the artwork. My personal preference would have been to have one stamp and the miniature sheet to extend the theme beyond the stamp. The next stamp was a joint stamp issue between India and South Africa. India's Foreign Minister visited South Africa in early June and dedicated the stamps at Pietermaritzburg Railway Station, where Mahatma Gandhi was removed from a train compartment in 1893 due to racial discrimination. Two other stamps, one on Dakshina Bharat Hindi Prachar Sabha and Scott Christian College were issued at events in Chennai and Nagercoil, respectively. Many more stamps are planned for issuance in the remainder of this year. Details for new stamp subjects are below. Like I had shared information for several new stamp subjects in January this year, I'm able to report that about 15 new additional have been made to India Post's stamp program for 2018. Since you're first hearing from me, don't forget to mention BetterPhilately when you use this information on other social media platforms. I've observed that many collectors have used my lists on their profiles and websites without proper mention of BetterPhilately. No meeting of the Philatelic Advisory Committee, a body that considers and recommends stamp issuance, has been held since late 2016. Thus, giving a free reign to the Minister of Communications to approve proposals that are routinely received by the Department of Posts. I don't know specific issue dates for the new stamps, but see the list below for all the additions. The stamp on Eastern Naval Command will be of Rs 15 denomination, while the one on Kakaji-Pappaji Maharaj will cost 5 Rupees. At the bottom of this post, I've been maintaining a comprehensive list of thematic and other stamps that have been approved since 2016. The newest additions are highlighted in blue, but I will incorporate these in the regular font during the next update. In addition to getting these stamp subjects figured out, I've been gathering other information to share as well. The main focus was to get clarity for print quantity of commemorative stamps and Mystamps and availability of stamps in post offices. There was some confusion about the print quantity of the CISF stamps from March this year. The stamp was issued as a se-tenant, but the proponent got one of the two stamps printed in sheets with only one design. I shared the details on a tweet earlier. I also found that severe delays in printing and delivery of Indian Cuisine, ASEAN-India Commemorative Summit and Solar System stamp sheetlets from the Hyderabad printing press may have been because the printer was inundated with last minute requests and was unable to complete past orders. It took 3-4 months for these delays to go away, but if India Post wants to keep stamp collectors interested, this should not recur. I've been trying to complete an accurate list of customized and personalized MyStamp issues as well as the print quantities. I will add the updated list under the MyStamp post soon. During this time, it was discovered that a set of 12 personalized MyStamp sheetlets on Zodiac Signs were printed and will be soon put for sale in post offices. Another few personalized MyStamp sheetlets on Shimla Ridge, Vaishno Devi temple and Pushkar Fair are not easily available and it would be ideal if ePostOffice starts selling these as well. Update (05 May 2018): Here's a rundown of news on Indian postage stamps from the last few weeks. India Post has not been sharing details for new stamp issue dates, but dedicating previously unannounced stamps. I will try to gather updates for fellow collectors soon and share on Twitter or over here. In the meanwhile, if you get dates or subjects for new stamps, do leave a comment below. The stamp on DRDO Diamond Jubilee, which was originally scheduled for issuance in early January was finally dedicated on 11th April by the Defense Minister of India at a defense exposition at Mahabalipuram, near Chennai. The stamp was well designed by Kamleshwar Singh, showing various military equipment and DRDO Bhawan on a colorful background. This and other designs by Kamleshwar Singh just goes on to show the need for India Post to use talented artists like Singh. The next stamp issue on Goan Tiatr was planned for issuance in 2017. The stamps and a miniature sheet were printed and several images were available on the internet. The stamps were likely withdrawn as result of the misspelled word 'Tiatr' as 'Tiater'. One would have assumed the stamp design to have been updated with the correct spelling and reprinted, but India Post for unknown reasons changed the designs completely and issued the new stamps along with a miniature sheet on 17th April in Panaji. The stamp information bulletin mentions Gulistaan as the stamp designer, but I'm not sure who designed the old 2017 version. The stamp printed in 2017 captured the essence of Goan theater and key personalities of Tiatr well, but the new stamps are quite simple and unappealing. Another point to note: Unlike the ICAR-CPCRI stamps from 2017/18, the Goan Tiatr stamps printed in 2017 haven't appeared online for sale. The Prime Minister of India dedicated a commemorative stamp on Hemwati Nandan Bahuguna, a political leader from Uttar Pradesh on 25th April in New Delhi to commence the birth centenary year. This stamp was among the several stamps on personalities approved for issuance in 2018. I had shared this news early in mid-January. The stamp and FDC nicely capture important facets of Bahuguna's life including his origins in the hill state of Uttarakhand. The last two stamps in April were previously unannounced and a damp squib from a design perspective. A se-tenant of 2 stamps was dedicated on 75 years of Safdarjung Hospital in New Delhi and a souvenir sheet of 4 stamps on Prithviraj Chauhan were released by MoS Communications in Ghazipur. The two stamps on Safdarjung Hospital were designed by Anuj and Ashoo Sharma, likely associated with the hospital. The stamps show several images of the past when the hospital was started as American Hospital along with an image of the main building spread on both the stamps. I wish there was come more detailed text, and better images used for developing this stamp design. I am also not entirely sure on the need for a se-tenant stamp on a hospital in New Delhi just completing 75 years of its existence. The stamp set on Prithviraj Chauhan is even more shocking. A stamp on this warrior king from Rajasthan could be developed with great detail, but the designer Alka Sharma chose to take a bust of the ruler and place it on four stamps with different background color and denomination. Little to no effort was put in covering some other facets of the king's life or rule. That said, the souvenir sheet was much better with coins and paintings shown with a picture of Taragarh Fort taken from the internet. Hoping the next stamp issues are more intricately designed and printed. Surprisingly no news for customized or personalized MyStamp was seen throughout April, and that was a much needed breather. I've been gathering information on several blank first day covers that are reaching various philatelic bureaus for stamp issuance this year. There are no major surprises than the subjects that are already covered at end of this post as well as what I share on Twitter. It seems possible that the joint issue with South Africa could now include Nelson Mandela as well. I had previously shared that Deendayal Upadhyaya and Oliver Tambo were two of the personalities selected for the stamp issue. Including Mahatma Gandhi cannot entirely be ruled out either, given his 150th birth anniversary celebrations will begin later this year. I've also seen that the much awaited stamp sheetlets for the ASEAN-India Commemorative Summit and the Solar System stamp issues are available for purchase in several post offices and on ePostOffice. The ASEAN-India sheetlet set contains 11 sheets with 20 stamps each (total Rs 1100) and the Solar System sheetlet set contains 8 sheets with 25-30 stamps each (total Rs 1150). All these sheets are being sold at face value, even on ePostOffice. Update (14 April 2018): I've been struggling to find time for adding new information, but it will get better in the next two weeks. In the meanwhile, India Post is back to thee same tardy ways of the old. Stamp issues are being scheduled with no notice, then delayed and postponed, yet again with no clear justification. Information on several forthcoming stamps was circulated on social media and I've added that information in the approved/possible list of stamp issues at the bottom of this post. The month of March saw one large commemorative stamp, on the eight known planets of our solar system. The stamps designed by Suresh Kumar Achari were depicted in a pattern similar to the orbits and distance from the sun. It was a decently designed stamp issue, but I wish India Post had worked with ISRO to depict images of at least earth and Mars taken by Indian space missions. The United States Postal Service has issued stamps on space exploration with actual images of planets in 1991 and 2016 in coordination with NASA. Pluto had not been explored in 1991, so the stamp on Pluto was inscribed with 'not yet explored'. By the time the next stamp on Pluto was released in 2016, NASA had reached the now dwarf planet and used an actual image with an inscription - Pluto, Explored. I digressed, but thought this was an interesting anecdote. The Indian solar system stamps were apparently printed in the form of sheetlets and miniature sheets, but the sheetlets have not been made available for purchase after almost of month of issuance. 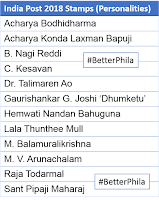 Why such delay from the printer, SPP Hyderabad? Sheetlets for ASEAN India Commemorative Summit from January 2018 haven't been put for sale either. My personal recommendation is to use CSP Kanpur and EPP Madras, the two private security printers along with the SPMCIL printing presses to print postal stamps. The private printers, especially CSP Kanpur has done some amazing work with India Post in 2001-2004 period. Several MyStamp sheetlets was also issued or made available for sale last month. Two of these issues, on Andhra Pradesh Tourism and Kumbh Prayagraj had been known to exist since late January, but were neither dedicated at a ceremony nor sold anywhere, so I'm going to consider these issued in March 2018, since they were put on ePostOffice last month. On the note of MyStamps, editors from Linns (Amos Media) that prints Scott Catalog has recently issued a note that Scott will only assign catalog numbers to personalized MyStamp issues and not for the pre-printed customized MyStamp issues that corporate, individual or organizations can obtain from India Post (minimum 5000 sheetlets). This was an important clarification, because the cost of collecting customized MyStamps is exorbitant and philatelists may not be interested in adding these to their Republic of India collection. Update (18 Mar 2018): It's been quite a while since the last update. I'd been busy with work and traveling as well. A few stamps were issued in the second half of February, but no surprises as such. I'd shared information on some of these stamp subjects earlier and most of those hold true. India and Iran jointly released a pair of stamps during the visit of the President of Iran to New Delhi on 17th February. The theme for these stamps was maritime linkage showing Deendayal Kandla and Chabahar Shahid Beheshti ports, one from each country. The stamp subject was a welcome change from the oft used dance theme. The stamp on film producer B. Nagi Reddi was the second one released in February. The Vice President of India dedicated this stamp in Chennai on the 23rd February. The third and final commemorative stamp of the month was dedicated by the Prime Minister of India to celebrate the golden jubilee of Auroville, an international township near Pondicherry (Puducherry). Though the stamp design was well received, the word Jubilee was incorrectly spelled as 'Jubliee' on the actual stamps. I've been highlighting typos in Indian stamps for almost a decade now, but to no avail. India Post should implement a proof reading team within the philately department and hold the stamp designer and other staff accountable for such silly errors. Early in March, a stamp on Biju Patnaik (5th March) and the CISF golden jubilee were also issued in Bhubaneswar and New Delhi respectively. The Biju Patnaik stamp design was pretty similar to the one issued in 1999. Brahm Prakash designed this stamp and I'm curious why the inscription 1916-2016 was necessary on the stamp released in 2018. It may be understood by some ardent followers of Biju Patnaik that his birth centenary was celebrated in 2016, but makes no sense from a design perspective. There may have been delay in realizing the political value in issuing this stamp, but the art work could have been updated to '1916-1997', showing the late leader's lifespan. Kamleshwar Singh came to India Post's rescue though. He designed a beautiful se-tenant of stamps on the Central Industrial Security Force (CISF) that was issued on 8th March during the 49th raising day celebration in New Delhi. It's among some of the best stamp designs issued in the recent past. A couple of MyStamp sheetlets were also issued in the last few weeks. The first one on Kalinga Institute of Technology was issued in Bhubaneswar and another one the famous Siddhivinayak Temple, Mumbai was also put on sale sometime in February. I'm surprised with the Mumbai temple MyStamp issuance because when I tried to purchase this sheetlet in Mumbai in the last week of February, the staff at Mumbai GPO was unaware of its sale. Hopefully it will be made available for purchase soon. Update (11 Feb 2018): The first month of the new year was fairly decent. India Post issued five stamps in January, several thematic/commemorative stamps and one personality. Most of these stamps were dedicated in the last week of January. The first one was a joint issue between India and Vietnam, which was dedicated in New Delhi on 25th January by India Post and Vietnam Post officials. I've already posted a separate post (click here to read) for this joint issue, which showed Buddhist monuments from both countries. That same day, India's Prime Minister along with Heads of State/Government from 10 ASEAN countries dedicated a set of stamps with 11 designs during the ASEAN-India Commemorative Summit 2018 in New Delhi. I am planning to write a separate blog post for this stamp issue, which was prepared by one of my favorite stamp designers, Sankha Samanta. The next stamp issue on Potter's Wheel was put on sale on ePostOffice on 26th January. This stamp issue, as has been the trend for last several years was crowdsourced. These stamps were issued in two designs with a miniature sheet. Even though some of the stamps were properly designed, majority of the stamp stocks haven't yet made it to the post offices. India Post's ePostOffice has been selling some of the stamps, but first day covers and brochures have seen excessive delays. Delivery of online stamp orders from ePostOffice is also slowing down, with most packets taking 4-5 weeks to reach collectors. India Post boasts of a huge network of transport and postal carriers, and if ePostOffice has to show improved growth, both the website and the actual delivery time needs to be significantly improved. The final stamp in January on Dr. Talimeren Ao was simultaneously dedicated in Guwahati (Assam) and Kohima (Nagaland) on 28th January by the Governors of both the state. Dr. Talimeren Ao, born in 1918 was India's soccer team captain in 1948 London Olympics and a civil surgeon. I've been able to confirm one of the MyStamp sheetlets on Akshar Deri, Gondal of Swaminarayan organization, but not the others. If any of you come across other MyStamp sheetlets listed below, let me know. I will wait for release events or special covers etc. to finalize the issue dates for these MyStamp sheetlets. Update (20 Jan 2018): Like I'd said in the last update, I can share details for personalities that will be honored with India Post stamps in 2018. Some of these are carry over from 2016-17 and I'm hoping these get issued finally. Some other details, especially for joint issue stamps are evolving fast. It's likely that joint issue stamps with Armenia, Vietnam and Serbia will be issued this year along with South Africa. I may end up writing a new blog post to track all joint issues with India. 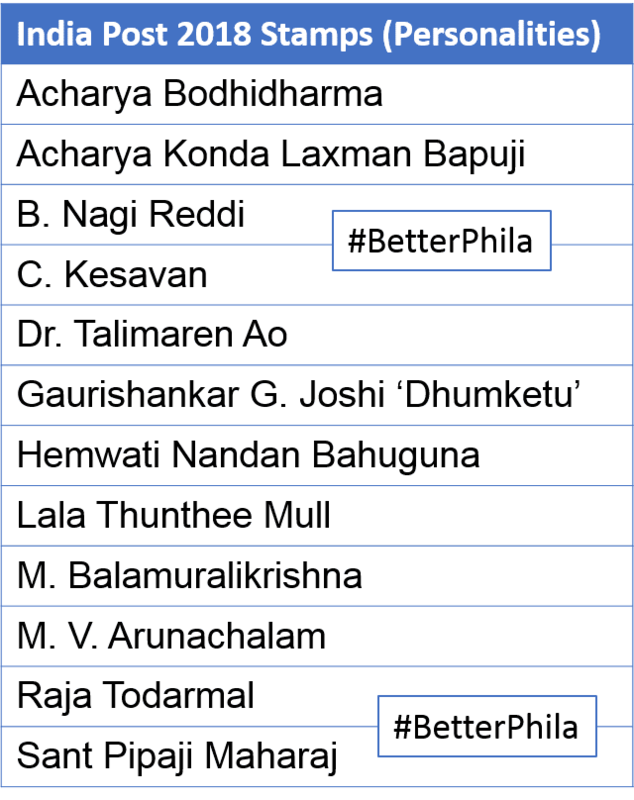 For now, I've updated the lists below. There are three ways I'm tracking stamp subjects - approved stamp issues, possible stamps and BetterPhilately wish list. The next stamp issues will likely be around the Republic Day on 26th January, which is when the ASEAN-India Commemorative Summit is also being held. Heads of State/Government from all 10 ASEAN countries are visiting India as chief guests for the Republic Day parade, an honor reserved for close friends of the Indian State. A set of 10-11 stamps, showing cultural connect with each country will be issued. I made a list of some things that link India with the ASEAN countries (click here to see on Twitter). It's possible that these could be depicted on the stamps, let's see. I've also been reading on social media that the joint issue with Vietnam will be dedicated sometime next week as well. Like you may have seen, I've already confirmed the proposed date for the Armenia-India joint issue as 21st March 2018 with a theme of dances in another blog post. Serbia also announced that a joint issue with India will be issued on 09th October. Update (16 Jan 2018): I've been sharing details for stamp subjects on the blog and on Twitter, which can be used from 2017-2022 to develop a good issue program. Some of the subjects are nearing their anniversary events and will likely be commemorated with postal stamps. Take a look at the list below. I will soon share additional details for some personalities that are likely to be on India Post stamps this year as well. Like always, do mention BetterPhilately in conversations on social media using #BetterPhila. Possible India Post stamp issues (2018). Update (15 Jan 2018): We are still waiting on details for stamps to be issued in 2018, but the year began with the first release on 08th January. Last year, two stamps viz. 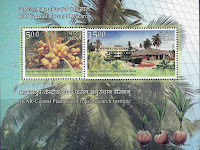 ICAR-Central Plantation Crops Research Institute and Goa Tiatr (125th anniversary) were printed, but never put for sale. It appeared that India Post took cognizance of the typos on both the stamps. 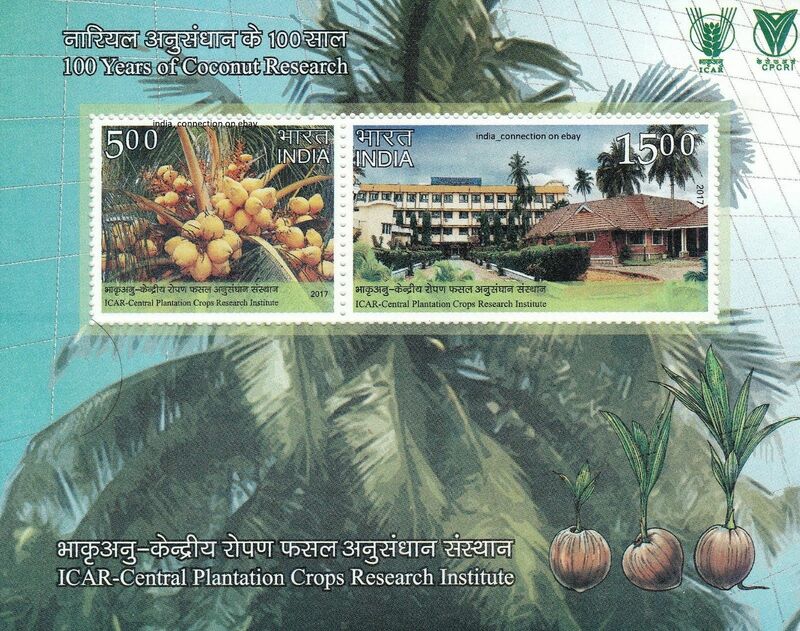 Like I had pointed out on the Twitter feed, ICAR-CPCRI stamp had an error in the Hindi acronym of ICAR, and the Goan Tiatr stamp spelled 'Tiatr' incorrectly as 'Tiater'. 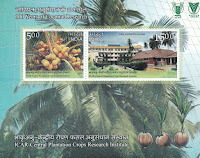 The ICAR-CPCRI stamp was re-printed with minor design changes and issued in Kasargod earlier this month. The Union Cabinet Minister for Statistics and Program Implementation was present along with postal officials and institute staff. The interesting piece is that copies of the old stamp (with 2017 year printed) are being sold for $40 or Rupees 7500 on eBay. I wonder how many of these old stamps slipped out illegally. I've posted images of both the 2017 and 2018 stamps below. In other news, it appears that a stamp (possibly, on Ramayana) will be issued on 25th January, during the India-ASEAN Commemorative Summit in New Delhi. India and South East Asian countries have a lot of common cultural aspect, Ramayana being one of them. 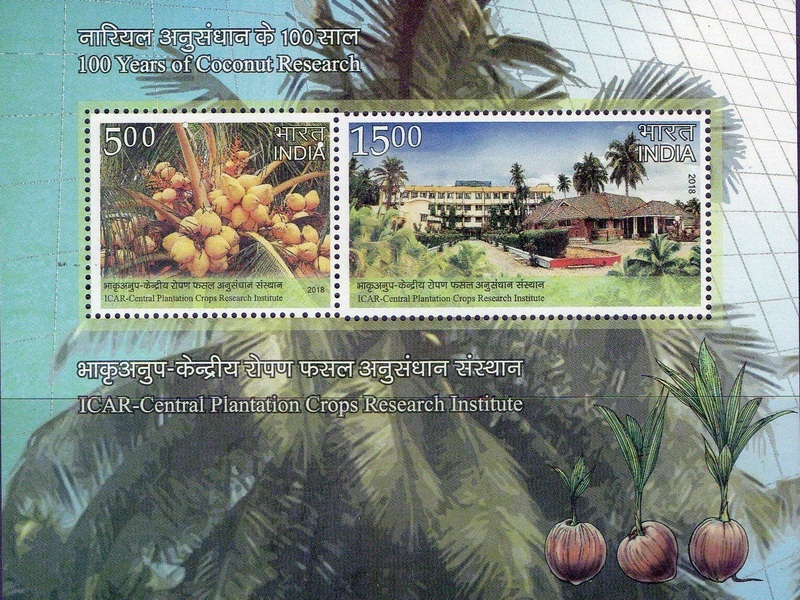 ICAR-CPCRI (Central Plantation Crops Research Institute) - New stamp from 2018 (above) and the old print from 2017 (below). There are minor design differences in the two sheets. Original Post (27 Dec 2017): I will start posting details for possible stamp issues and other updates for 2018 in a few weeks, but I'm carrying over several stamp subjects that were either or approved or considered for issuance and could be released in 2018. Let me know if you have other details to share with fellow stamp collectors. Happy New Year! The Auroville golden jubilee stamp released by PM Narendra Modi misspells jubilee as "jubliee"! Thanks for highlighting this issue. I've raised it on Twitter and several other stamp groups on social media have picked it up as well. I'm glad you used BetterPhilately to provide this information first. Thanks and keep reading BP. MyStamp on the occasion of the Diamond Jubilee celebrations of Indian Institute of Technology Bombay, Mumbai released by Hon'ble Governor of Maharashtra, Shri. Vidyasagar Rao on 10th March 2018.
very informative which should be useful to young budding Philatelists.